Building the brain from the beginning. 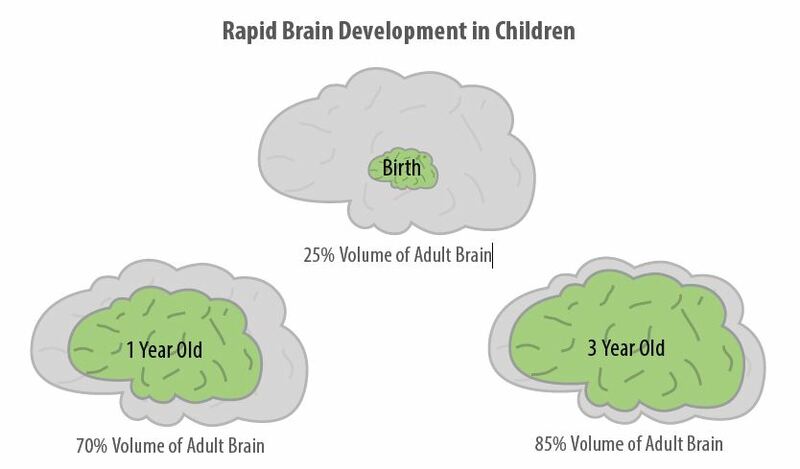 By the time a child turns 3, his brain is 85% the volume of an adult brain. That means that nearly all of the neural connections that will ever form have already been set. These three years are when the neurological tracks are laid—and all future learning will ride those tracks. 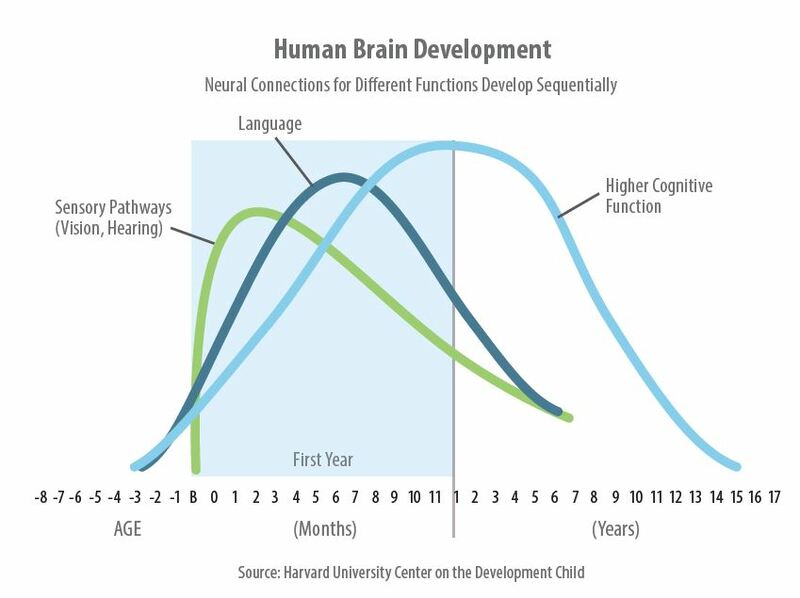 The quality of those early neural connections is of paramount important to success in kindergarten and in life. Brains are built from the bottom up. The basic sensory skills develop first, followed by language connections. Both of these areas reach peak development during the first year of life. These skill sets serve as the basis for higher cognitive functions, which reaches a developmental peak between ages 1 and 5. To develop in a healthy way, young minds need stability and stimulation, through secure attachments to caring adults. When a baby is safe, loved, and bonded to her caregivers, healthy brain development is practically a foregone conclusion. While all brains undergo stress, there’s a difference between beneficial stress and toxic stress. Beneficial stress challenges the developing brain to form new connections, especially when there’s a nurturing caregiver to help guide the child’s reaction. Toxic stress, on the other hand, can derail normal brain development and causes a physical interruption in how neural connections are built. Healthy, secure relationships with adults an mitigate the effects of toxic stress. But if those relationships are absent, the impact of unhealthy stressors may be powerful and life long. The brain regions and circuits associated with executive functioning have extensive interconnections with deeper brain structures that control the developing child’s responses to threat and stress. This implies that the developing executive functioning system both influences and is affected by the young child’s experience and management of threat, stress and strong emotions. 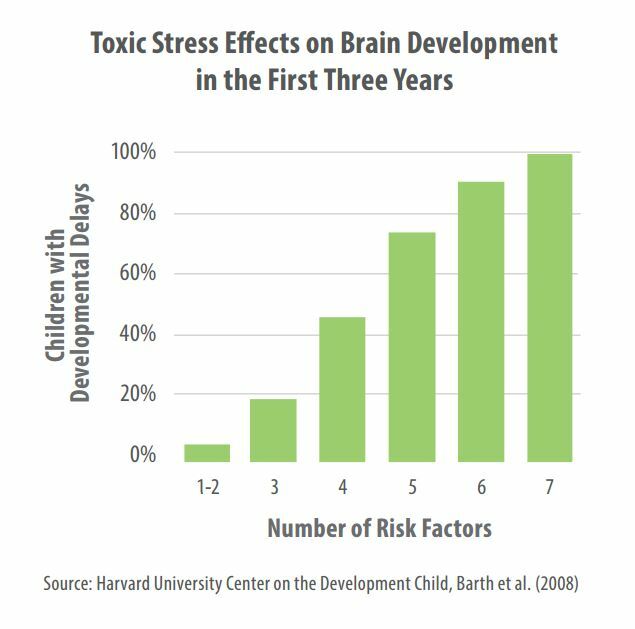 The number of toxic stress exposures or risk factors compounds negative outcomes for early childhood brain development. Damage to the developing executive functioning system shows up in as problem behaviors in the learning environment—inability to stay on task, losing control of emotions frequently, failure to retain information. What does this all mean? Making sure that babies and toddlers have safe, nurturing relationships is critical to their healthy brain development and their future success in school and life. Tiny brains are built interaction by interaction. Each positive interaction creates a neural connection. Children who have healthy relationships with parents and caregivers, and are receiving the stimulation and interactions they need, develop a strong, complex neural network and the social and emotional skills that matter for kindergarten success. Talk – No matter what you’re doing with your baby, talk through it. The sound of your voice is soothing to her, and hearing all of your words are a source of endless stimulation. Respond – When your baby needs something (even when it’s just attention) provide it. This lets them know that they are safe and their needs will be met. Read – Log some quality lap time by reading to your child, pointing out words and pictures. And provide brightly-colored books for your baby to look at, play with and chew on. Play – Peekaboo, This Little Piggy and the Itsy Bitsy Spider are wonderful games to stimulate young minds and help bond your child to you. Smile and make faces – Seeing your face being happy or silly helps babies make the connection between feeling and actions. It begins to help her identify emotions. Serve-and-return communications – When your baby starts experimenting with sounds, echo those sounds back to her. Or act as though you’re having a conversation. This type of interaction is a powerful builder of language connections in the brain. Praise – Show delight in your baby or toddler in all of their positive activities. This encourages positive behaviors, and provides a clear comparison when negative behaviors occur. For a child who is used to receiving praise, the absence of attention or praise is usually punishment enough to correct a behavior.